BuySoundtrax is proud to announce the release of a new recording of the score for the 1984 film, The Bounty composed by electronic music pioneer Vangelis (Chariots of Fire, Blade Runner). Vangelis’ music is faithfully recreated by multimedia composer, orchestrator and arranger Dominik Hauser. The Bounty is based on Richard Hough’s fictional account of the events that led to the mutiny on the HMS Bounty in 1789, Captain Bligh and Mr. Christian. It was originally intended as a two-part vehicle from famed director David Lean, and was to feature a score by his frequent collaborator Maurice Jarre. After Warner Bros. withdrew their support for the film and Robert Bolt suffered a stroke while writing the film, Lean left the project. Dino De Laurentiis, who had already sunk 4 million dollars into the production, was able to secure a deal from Orion Pictures and hired Roger Donaldson to take over as director. Vangelis’ Oscar-winning 1981 score for Chariots of Fire had set a precedent in electronic film scoring (even though its primary instrument was, in fact, an acoustic piano). By eschewing music of the film’s 1924 time period and introducing a recognizably synthetic sound design, Vangelis proved capable of underscoring not milieu or period, but subtext, raw emotion, and psychological landscape, laying down an aesthetic musical tableau that expressed much of the story’s purpose and that of its characters. The same approach gave The Bounty a continual pulse of inevitable foreboding in the clash of personalities in conflict while also musically reflecting the dappled rhythm of winds and waves and shipboard sounds that were so much a part of the film’s sound design. 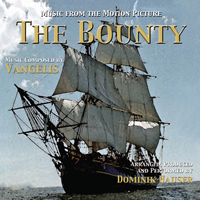 In addition to the score for The Bounty,the recording features traditional Irish, Scottish and British folk shanties, along with bonus tracks -- short suites from three other unreleased Vangelis scores: Bitter Moon, Francesco, and La Peste (The Plague), arranged by Hauser.